I started with a Chilled White Corn Soup with Avocado relish and Paprika Oil. The oil was a beautiful touch but also was so good that i made sure to get a bit of it in every spoonful. Next was Grilled Asparagus with Pickled Vegetables and Herbed Ricotta, a preparation i’d never had, unfortunately. Wow. I didn’t know you could cook asparagus so that it was crisp and tender at the same time, and the ricotta snuggled up to it to create a memorable dish. Jeff had the PEI Mussels, a classic moules marinière, but Karen punched it up by adding a little red pepper to the broth and drizzling the bowl with lemon ailoi. Yow! Jeff said he’d never had better, and the stingy little taste i got made me want to try this dish for myself. We split an order of the Garlic Parmesan Kennebec Fries, which are right up close to the Truffle Parmesan Fries at Mission Beach Cafe – in other words, dangerously good for folks who are supposed to be limiting their carbohydrates. Jeff had the Line-Caught Swordfish with Artichoke, Slow-roasted Tomato, and Meyer Lemon Butter. He called it very good. I called my bite great. I had my old favorite, the Confit Chicken Wings, which Karen has changed a bit from Jason’s preparation. She doesn’t add the pomegranate glaze Jason used, but she serves them with a Salsa Verde and Fresno Chiles, which changes the exterior flavor, but the wings themselves remain deliciously creamy and tender. I love both preparations. For dessert, Jeff had the strawberry-rhubarb dish, which i sampled to confirm my disinterest in rhubarb but was kinda shocked to find it very tasty. Still, it wasn’t chocolate, so i just had a couple of small spoons. The bottom line here is that the restaurant is at least as good under Karen as Jason, but i’ll hold off until i’ve had more of her dishes before i call her better. Eat here, folks. The manager, Thuy, is a delight and the waiters, Callum and Rory (who doubles as bartender) are both pleasant and skillful. What’s not to like? 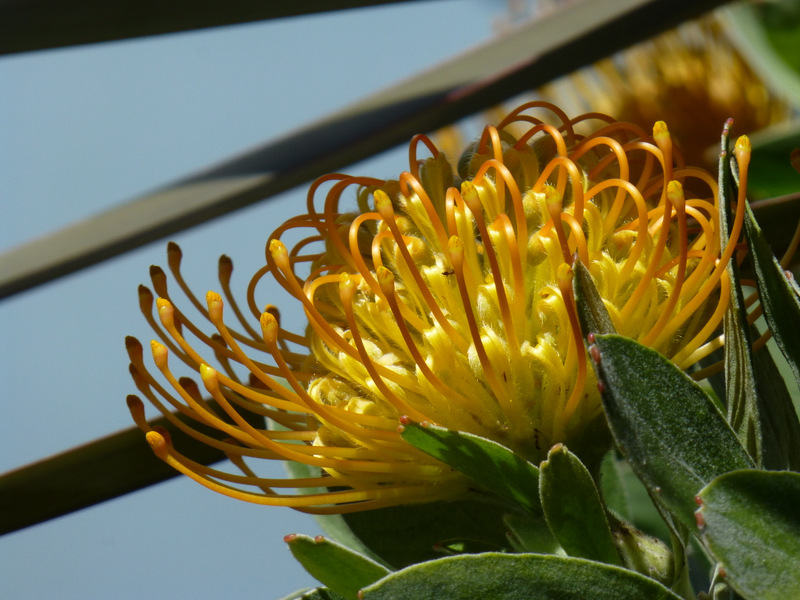 No food pic this time, so here’s a yellow Leucospermum on Castro Street that’s good enough to eat.